At some point throughout your travels, you will become a pedestrian. Whether you are casually walking, jogging, shopping, or simply commuting to work, it will be necessary for you to exit your vehicle and interact as a pedestrian with the driving traffic. The majority of vehicular traffic within City of Billings seems to be unaware of pedestrians and laws governing them. Whether it’s the disregard of pedestrians waiting to cross at crosswalks, or lack of knowledge of the laws that protect them, pedestrians are seen as a nuisance to vehicular traffic and not afforded the attention they deserve. In 2011, the City of Billings adopted a Complete Streets Policy (https://www.ci.billings.mt.us/DocumentCenter/Home/View/7465). This resolution defines a complete street as a road that has design features that contribute to a safe, convenient, or comfortable travel experience for all users. More generally, a complete street is one that accounts for not only vehicles, but also bicycles, pedestrians, transit, and users of all ages and abilities. This policy has placed added importance to the design and education of all types of users of the public roadways and the interaction between the different users. At any and all crosswalks (marked or unmarked; at an intersection or midblock), drivers are required by State law to yield the right-of-way, slowing down or stopping if need be, to pedestrians. However, this is not happening in Billings. The Engineering Division has implemented a number of different crossing treatments in an effort to draw attention of the drivers to crossing pedestrians to improve both the compliance rate and safety of the intersections. 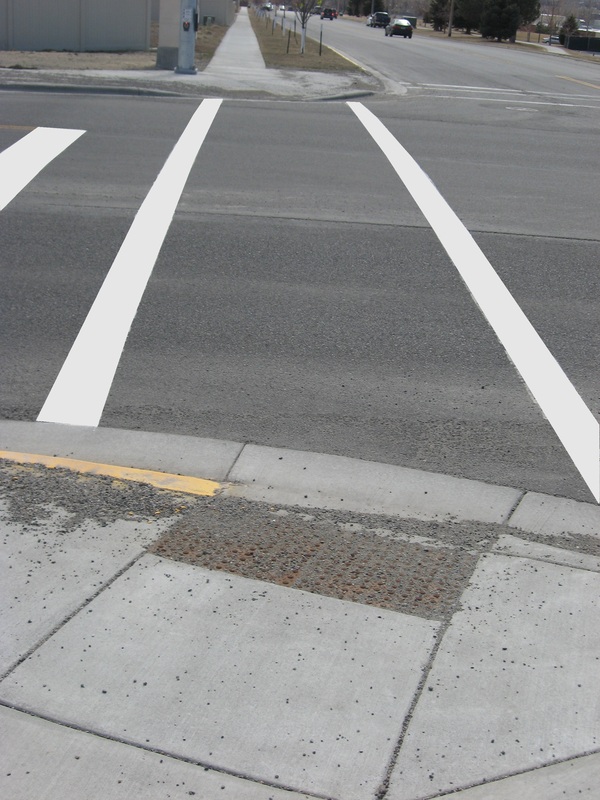 Ladder-style crosswalks: These crosswalks use more paint to highlight the crossing and have been reserved for school crossings or trail crossings. Pedestrian refuge island: This treatment provides a “safety” island for pedestrians to rest as they cross one direction of traffic at a time. This enhancement also minimizes the crossing distance and the exposure of the pedestrians within the traveled way. School crossings: These crosswalks are unique in their proximity to schools and come with their own sign clusters. More information can be found on the City’s school crossings at the following link: https://www.ci.billings.mt.us/2098. Overhead signage and lighting: The signage and lighting enhances the visibility of the crossing and thus gives the driver advanced warning that pedestrians may be present. Rapid Rectangular Flashing Beacon (RRFB): RRFBs are pedestrian activated flashers located beneath the crossing signage. The unique pattern in which the beacons flash has proven to better alert drivers to the presence of pedestrians. This enhancement has been reserved for trail crossings of major roadways. HAWK Signals: This is a relatively new and effective crosswalk treatment in the City. Additional information can be found at the following link: https://www.ci.billings.mt.us/2028.